Adult apterae of Aphis solanella are dull black or blackish brown, occasionally with white pleural transverse wax stripes. The longest hair on antennal segment III is 0.6-1.9 times the basal diameter of antennal segment three, in most specimens shorter than 1.5 times the basal diameter. The third antennal segment of the adult Aphis solanella aptera is 11-20 times longer than the longest hair borne upon it (c.f. Aphis fabae fabae & Aphis fabae cirsiiacanthoidis where the third antennal segment is 4-9 times longer than the longest hair borne upon it). The dorsum has variable dark markings usually with dark sclerotic bands on the pronotum, mesonotum and abdominal tergites 7 and 8, and small dark marginal sclerites. They have marginal tubercles on abdominal segments VI and usually also on I (see first picture below), and sometimes smaller ones on some of the segments II-IV. 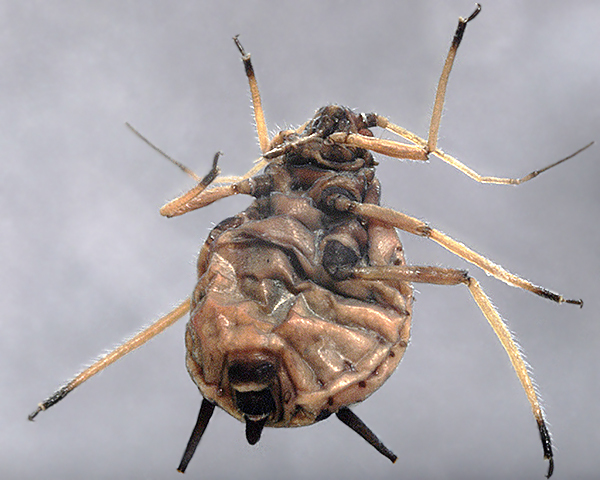 Marginal tubercles are more often present on Aphis solanella than on the different subspecies of Aphis fabae, but about 40-50% of specimens still have no marginal tubercles on II-IV. The siphunculi and cauda are dark. The body length of the adult aptera is 1.2-2.6 mm. The micrographs below show an adult aptera of Aphis solanella dorsal and ventral. In Europe Aphis solanella has spindle (Euonymus) as its primary host. It can also live on mock orange (Philadelphus) and viburnum (Viburnum), but it does not thrive well on the latter. Oviparae are rarely produced on Philadelphus and never on Viburnum. 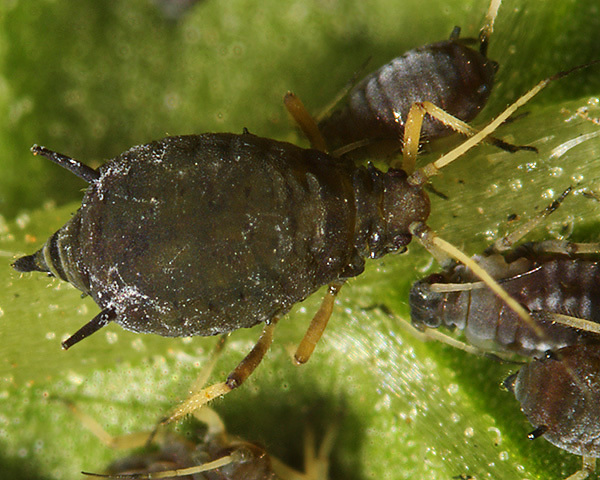 Aphis solanella migrates to a wide range of plants, including many used by Aphis fabae, as well as black nightshade (Solanum nigrum) and black bindweed (Fallopia convolvulus). It characteristically crumples and curls the leaves of black nightshade. Aphis solanella will not move to bean (Vicia faba), beet (Beta) or poppy (Papaver), but it can be a pest on tomatoes (Solanum lycopersicum), potatoes (Solanum tuberosum) and peppers (Capsicum annuum). Aphis solanella is found throughout Europe and in Asia, Africa and South America. Blackman & Eastop list 7 species of aphid as feeding on common spindle (Euonymus europaeus) worldwide, and provide formal identification keys. Baker (2015) lists all 7 as occurring in Britain: Aphis aurantii, Aphis fabae cirsiiacanthoidis, Aphis evonymi, Aphis fabae fabae, Aphis solanella, Macrosiphum euphorbiae and Myzus persicae. 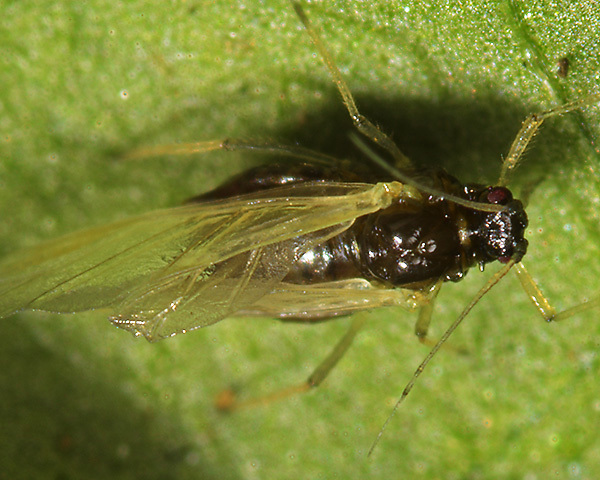 We have restricted our listing of other aphid species on secondary hosts of Aphis solanella to the most characteristic secondary host, black nightshade (Solanum nigrum), albeit it has many other secondary hosts. Blackman & Eastop list 15 species of aphid as feeding on black nightshade (Solanum nigrum) worldwide, and provide formal identification keys. 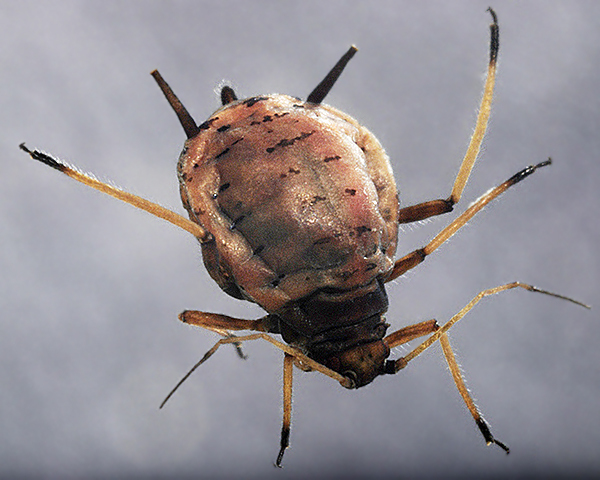 Baker (2015) lists 14 of these as occurring in Britain: Aphis craccivora, Aphis fabae sp. gp., Aphis gossypii, Aphis nasturtii, Aphis nerii, Aphis solanella, Aphis spiraecola, Aulacorthum solani, Macrosiphum euphorbiae, Myzus ornatus, Myzus persicae, Neomyzus circumflexus, Rhopalosiphoninus latysiphon and Smynthurodes betae.